The vastness of the Okavango Delta stretched out below us. There were no hills to judge distance by and the horizon was lost in a haze as it melted into the sky, a sky greyed by windblown dust and the smoke of many fires burning around the delta. 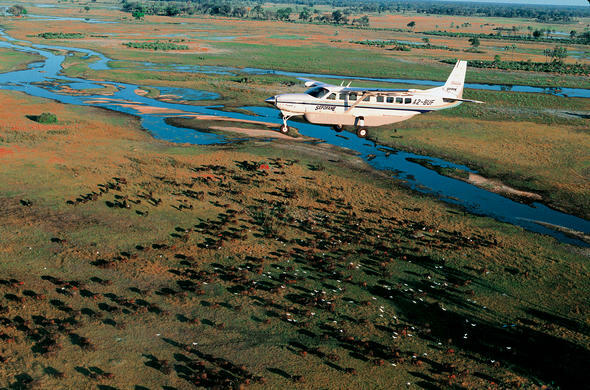 It might have been intimidating had I not known that we would soon be landing at Camp Okavango. 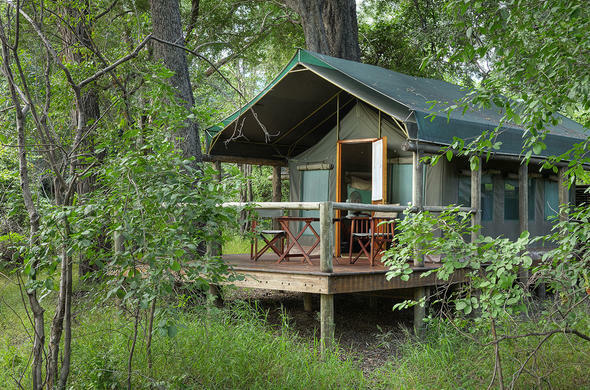 Camp Okavango is a luxury lodge situated on an Island in the permanent water area of Botswana's Okavango Delta. It is pure luxury, catering for visitors who are seeking the best that Africa has to offer, but with a high degree of comfort. From the air the island seems remote, which it is, but the sight of the airstrip will still any misgivings. 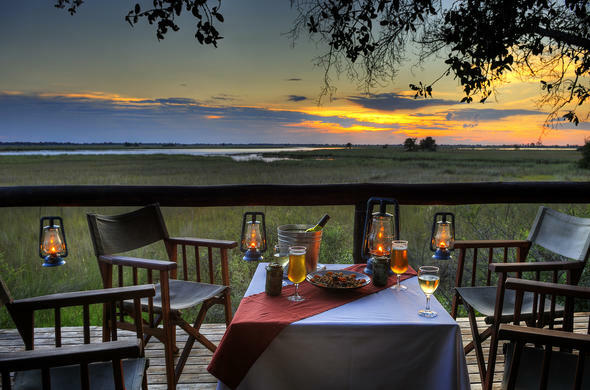 Camp Okavango came into being over twenty five years ago when a visitor from the USA, Jesse Neil, fell in love with Botswana and decided on establishing a lodge, not so much as a place for guests but as a personal signature. Jesse Neil spared no expense. 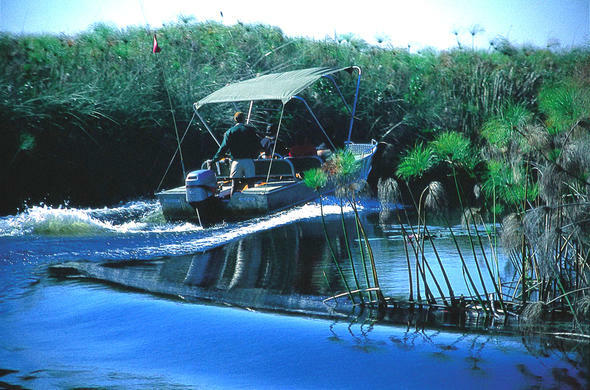 Camp Okavango was so ahead of its time that it was ridiculed for its extravagance. Beverly Hills had come to the Okavango!Jesse Neil is no longer at Camp Okavango but her legend lives on. The house is still there and is now used as accommodation at the lodge. Many of those who ridiculed her all those years ago are now involved in companies that are erecting far more extravagant lodges in the Okavango today.2.00 pm: Despite been in the Okavango Delta we were still in the Kalahari Desert and the combination of marsh scent and Kalahari dust was an intoxicating mixture, ripping at my senses. It was hot, a marsh and Kalahari dust scent hot. A fish eagle shouted across the delta in an arrogant territorial display. 6.15 pm: The evening was heading to its conclusion and the moment was taking stock as our canoes smashed through the water and vegetation, the only sound in the silence of the place. The water was reflecting the moment. Tomorrow: We set out early for Camp Moremi with the boat swerving through the channels dodging the papyrus and water berries. We saw fish eagles, herons and darters. A pair of wattled cranes took to the wing as we passed an open plain on one of the many islands that make up this part of the Okavango. 'Wattled cranes are an endangered species in Africa. In Botswana, however, their numbers are safe. The greatest threat to them is the shrinking of the natural areas due to human encroachment! 'In places the vegetation was perfectly reflected on the water before we crashed past and smashed the reflections into ripples of intrusion. At Gadikwe there were many birds at the breeding colony. Herons, egrets and darters mingled in black and white, silhouetted against blue and green and the cacophony of the gathering. We stopped on a small island to have tea and to change boats. I walked a short distance away from the group and sat on a termite mound. Some lechwe were grazing on the opposite side of the island and they all turned to stare at me. All around me I could see signs of elephant. Dung and broken branches littered the ground. I reflected on how little the island had been disturbed by us, in comparison to other parts of the wilderness, in our subconscious quest to control all the wild areas in the mistaken belief that we are protecting them. The Okavango Delta remains a pristine area, but I did wonder how long this would last. I felt privileged to be there.The delta was opening up as we approached the Xaxanaka area. There was less papyrus and in places the channels widened into lagoons. The scenery was spectacular. Two male elephant that were drinking barely took notice of us as we went past. 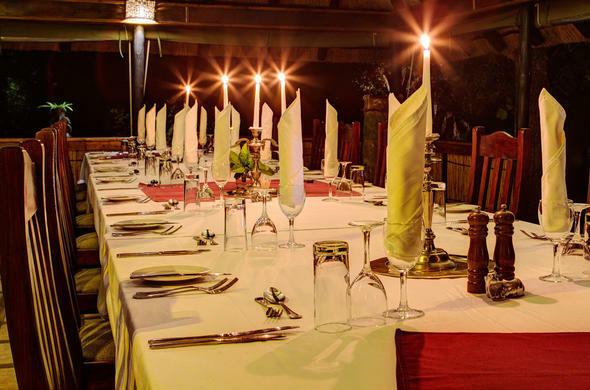 The rooms are elegantly styled on the safaris of old, providing luxury and yet keeping the old feel. The main building is built up on stilts allowing for a view over the Xaxanaka lagoon. A raised viewing deck at the edge of the water provides great views and is a wonderful place for contemplation or merely just to sit and relax. On the afternoon drive we headed out towards Paradise Pools where a pride of lions had been sighted on the morning game drive. 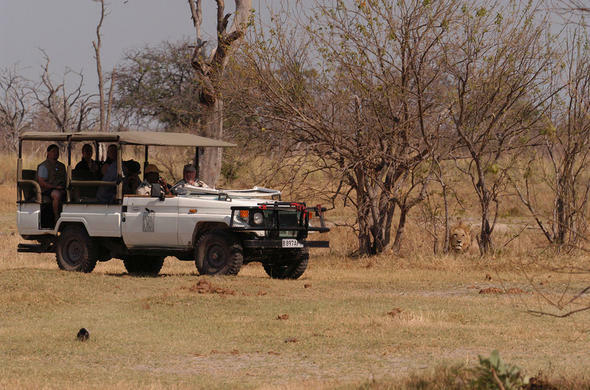 In the mopane woodland beyond the airstrip a breeding herd of elephant were moving slowly as they fed on the grass and mopane. A herd of lechwe splashed through the water as we approached the Paradise area, stopping to look back at us when they were a safe distance away.7.15 am: The light mist was reflecting the sunrise into an indescribable beauty. Only one sense was active in that moment. The sense of self! I pulled away from everything, allowing myself to steal a moment to marvel at the creators work. Impala are alert to the sounds as birds herald the morning. Light, dew and the anticipation of the moment add a new dimension to the wilderness awakening. 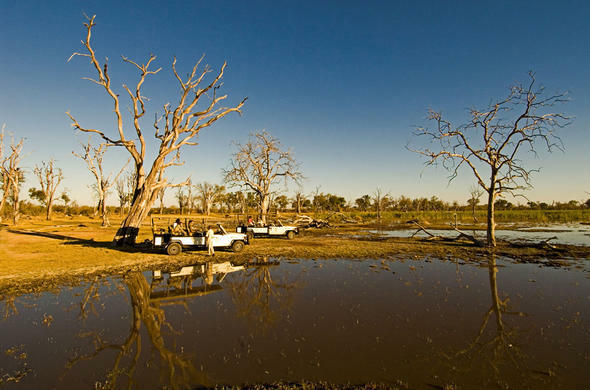 Hippo movements are controlled by the seasons in the south western delta where the water levels are dictated by the rains in the highlands on a distant plateau. The Okavango Delta is one of the most beautiful places on earth and there are moments that happen that are so dramatic that they can seem to have been fantasy.